As of version 1.1 you can reward your users with points for purchases made in your Easy Digital Downloads powered store. In order to start rewarding your users with points, we need to know how much points each product in your store pays out along with what point type you want to reward. If you have more than one point type installed, you can select to reward users with one particular type or multiple. In order to set this amount, just edit your store product and you should see the “myCRED” metabox in the sidebar. If you do not see the metabox, click on “Screen Options” in the top right corner of the screen and make sure the metabox is checked to be shown. Tick the checkbox to enable points rewards when the product is purchased. 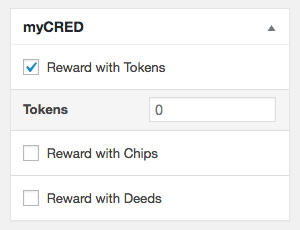 No points will be paid out as a reward if a user is set to be excluded from the point type you are rewarding or if the order was paid using points!